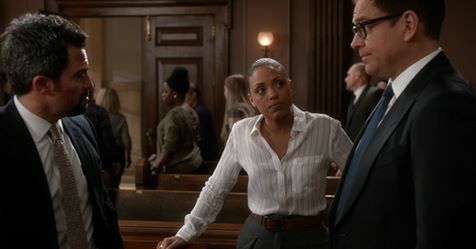 Tonight on CBS their drama Bull inspired by Dr. Phil McGraw airs with an all-new Monday, April 15, 2019, episode and we have your Bull recap below. On tonight’s Bull season 3 episode 19 called, “Bounty,” as per the CBS synopsis, “Danny enlists Bull’s help with the assault trial of her former FBI mentor, Trent Bolton (Manny Perez), a bounty hunter who kidnapped the wrong mark during his first assignment. A man named Trent waits for a man to come out of his house. He attacks him, knocks him out and brings him to an alley where another man shows up. He has the man he wanted in the trunk. The only problem – he has the wrong guy. Trent gets upset. He brings the man to the ER and leaves him. Danny comes to the prison to meet an old acquaintance named Trent. He tells her he isn’t with the FBI anymore since he made some bad decisions. Now he is cleaned up and working as a bounty hunter. He needs help after picking up the wrong guy. Dani heads back to the office and tells Bull who doesn’t have a lot of hope when it comes to taking this case. Bull meets with the new very young ADA. She laughs at Bull for trying to make a deal on Trent’s behalf. The more they talk the more Bull becomes irritated and decides to take the case. Benny and Bull arrive at the prison to meet Trent who has bruising due to some fights. They tell him they will try to get him in solitary. After going over his connection to Danny who has called him a good guy they say goodbye. Trent asks if they could call his ex-wife so his son knows where he is. Benny and Bull start the jury process the next day. They pick people who are easy to accept the mistakes of others. The case gets underway with the man who Trent knocked out and left at the ER taking the stand. The jury sighs with empathy after the details being knocked out by Trent and that he is a firefighter. Benny asks the man a few of his own questions. Back at the office, Danny shows Benny and Bull video footage of the ER where the man was brought. For some reason, he doesn’t stay and gets up and leaves 3 minutes after Trent left him there. The next day the prosecutor rests her case. Benny brings Trent to the stand who tells them he was only doing his job. He picked the wrong man but tried to rectify the situation by bringing him to the hospital. The jury doesn’t budge with most of them staying in the red. Benny calls Michael the man Trent brought to the hospital. Benny talks about how he is an MMA fighter on top of being a firefighter who Benny was told was in the middle of retiring. Benny also points out that the man who Trent was looking for also works out at the same gym as Michael who then asks to plead the 5th. He also has trouble explaining how he was knocked out by one punch and stayed unconscious only to wake in the ER and leave. Benny calls the man who hired Trent next to the stand. After a cross-examination, Benny exposes this all as a set up with Trent the victim who was lead on a wild goose chase to get the wrong guy while the real one was skipping town. The ADA becomes worked up and on recess brokers a deal with Bull who tells her she is young but good and has a future. Danny is happy to see Trent go free.